A deal disclosed Thursday will allow the mass slaughter of hundreds of wild bison migrating from Yellowstone National Park, while sparing 25 animals that American Indian tribes want to start new herds. The Associated Press obtained details on the deal between Montana, the park and the U.S. Department of Agriculture prior to its public disclosure. It resulted from two weeks of intensive negotiations and removes a political obstacle for the park after Montana Gov. Steve Bullock on Jan. 19 temporarily blocked Yellowstone's plan to kill up to 1,300 of Yellowstone's 5,500 bison this winter. The terms are likely to dampen public outcry by averting slaughter for most of a small group of bison that had been earmarked for a conservation effort intended at establishing new herds elsewhere. Bullock lifted the slaughter ban in a Thursday letter to Yellowstone Superintendent Dan Wenk that outlined the agreement to spare the 25 bison. 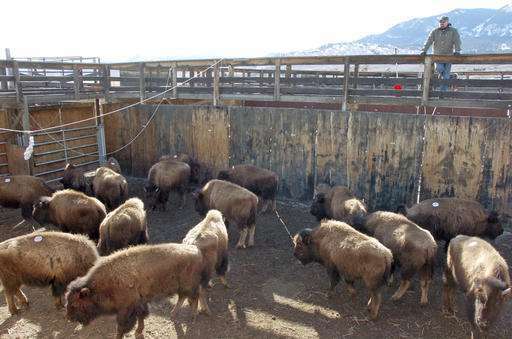 "My intent in invoking the (ban) was to prevent the slaughter of these bison and preserve them for transport to Fort Peck (Indian Reservation)," Bullock wrote. "The parties have committed that these animals will be quarantined and safeguarded until they are ready for shipment." Wildlife advocates fiercely oppose the periodic slaughters of Yellowstone's world-famous bison herds. Stephany Seay with the Buffalo Field Campaign said what's needed is to repeal a law that places wild bison under the authority of the Montana livestock department instead of its wildlife agency. "Stop the slaughter, let them roam and manage them just like we do with elk, just like we do with deer, just like we do with other wildlife," Seay said. Park officials say they have little choice under a 16-year-old program intended to curb the animals' annual migration into Montana to prevent transmitting the disease brucellosis to cattle. Brucellosis can cause pregnant animals to abort their young. It was brought to North America by the infected livestock of early settlers and has since been eradicated nationwide except in Yellowstone-area wildlife, including bison and elk. The 25 bull bison saved from slaughter will be kept for a year for disease monitoring at a federal quarantine facility just north of the park in Corwin Springs. They will later be relocated to Fort Peck Reservation, home of the Assiniboine and Sioux tribes. Yellowstone spokeswoman Jody Lyle said the deal with the state and Agriculture Department marked a first step toward a long-term program to use some disease-free bison for conservation instead of sending them to slaughter. Under public pressure, Yellowstone administrators last year proposed relocating about 40 animals captured during their migration to Fort Peck, which is already home to a small herd of park bison. When Montana livestock officials objected to the transfer because of disease concerns, park officials said they would kill the animals, prompting Bullock to invoke the ban on slaughters. The 40 bison had tested negative for brucellosis multiple times since they were captured last winter. But because the animals potentially were exposed to diseased bison while being held in pens along the park boundary, the 15 females from the group will be slaughtered and only the males will be spared, Montana state veterinarian Marty Zaluski said. The fate of about 20 bison already at the small town of Corwin Springs in Montana north of Yellowstone is uncertain. The animals were captured several years ago for use in animal birth control experiments. State officials had said earlier they would be slaughtered to make way for the 25 spared bulls. But Bullock told Wenk that federal and state officials have agreed to further discussions on relocating the animals to Fort Peck. So far this winter, hunters have shot more than 300 bison as they left the park seeking food at lower elevations in Montana, according to state wildlife officials. Cold, snowy conditions are expected to prompt more bison to leave Yellowstone in coming days as foraging becomes more difficult. 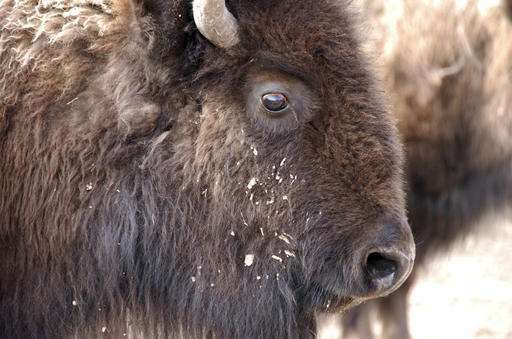 About 400 migrating bison have been captured near the Yellowstone boundary and are being held for shipment to slaughter. Shipments will begin as soon as the park can make arrangements, Lyle said. Meat from slaughtered animals is distributed to American Indian tribes across the region. No transmissions of brucellosis from wild bison to livestock have been recorded, according to researchers and livestock officials. That's in part because more than 5,000 bison were killed or captured trying to leave the park since 1985. A state-federal agreement signed in 2000 set a population goal of 3,000 bison in the park.